Personally, I don’t see why there’s all this excitement about Obama. He seems intelligent and personable but he doesn’t seem to have a heckuva lot of experience on a national level. Some people have compared him to JFK saying he didn’t have much experience either, but JFK had been a congressman for 6 years and a senator for 8 when he was elected. Obama will have had 4 years under his belt as a junior senator. He has ideas though and has written a book (which shows an intellect far beyond the present would-be dictator), but anyone can have ideas…the question is how well he can carry them out. Then there’s the issue of his electability. The other Democratic frontrunner, Hilary, just isn’t very electable–she’s very divisive and a lot of people on the right think she’s the Antichrist. And there’s the big question about whether a woman can be elected yet in this country. There are more than a few states that she might as well write off from the get-go. True, they’re red states to begin with, but there’s a few purple states that may simply be turned off to a woman “leader of the free world”. Obama’s not a woman, but he’s black…does anyone remember that incident in THIS year’s election where a black candidate was smeared by a Republican ad that ended with a blonde woman telling him the “call her”? Recall that that candidate lost. He’s also been swiftboated even now because of his middle name, Hussein. The right wing media pundits have already been making an issue of this name, as if it made him some kind of second cousin to the late Saddam Hussein (NNPA, George Curry) Media honeymoon ends for Barack Hussein Obama. Then there was the CNN gaffe: while asking the question, “Where’s Osama?” a “typographical error” occurred on the screen and the question, “Where’s Obama?” appeared instead. (UK Guardian) Washington’s new name game. CNN of course apologized profusely, but you see the trend…Obama’s not simply a black American, he’s also one with a very Muslim name. Obama IS a Christian, but with a moniker like he has, most people will assume he ain’t–as in fact I did in the earlier edition of this column and apologize for my confusion, the confusion I may have caused and the lack of fact-checking on my part. Muslim might as well be synonymous with “terrorist” in some people’s minds…think of the problems Keith Ellison ran into by wanting to take his oath of office on a Qu’ran (AFP) Congressman says Muslim lawmaker’s election threatens US values. 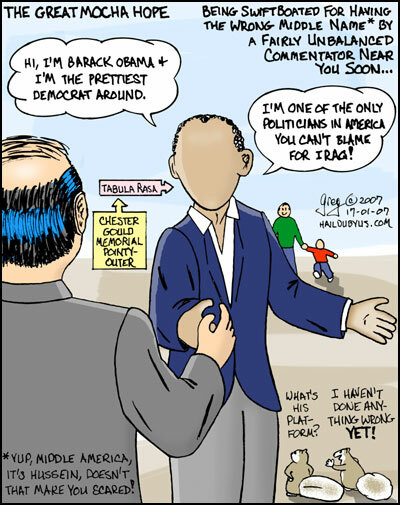 Obama is going to have to explain about a non-issue every other week during his early campaigning. So why all the excitement in the Democratic camp? I think it’s because Obama is a blank slate on which people who have been out of power so long are pinning their dreams on. We don’t really know what he stands for, therefore we hope he stands for what we believe in. “The stuff that dreams are made of,” to quote Sam Spade paraphrasing Shakespeare. Two years will tell us if he’s just a dream.